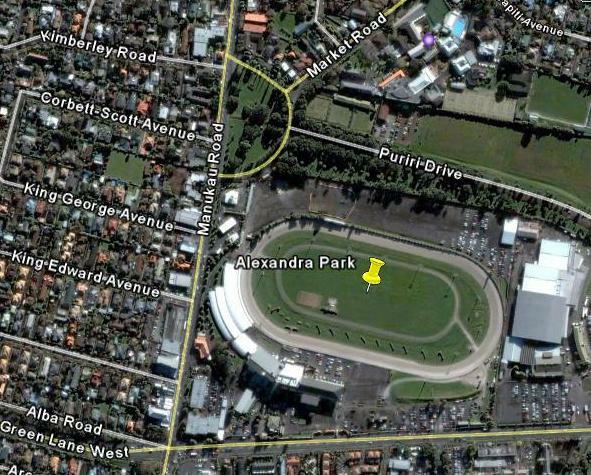 Alexandra Park where this year's Auckland Flower Show is being held is on the corner of Greenlane Road and Manukau Rd in Epsom, Auckland, and is very easy to get to both from within Auckland as well as from outside Auckland. If you are coming from the west and live close to any railway station, the easiest way is to get yourself to the nearest railway station and jump on a frequent train to Newmarket West. Trains leave approx every 30-40 minutes during the week from Waitakere (every 15-30 minutes from Henderson), and every 60 minutes on the weekend, and can pick you up from Swanson, Ranui, Sturges Rd, Henderson, Sunnyvale, Glen Eden, New Lynn, Avondale, Mt Albert, Baldwin Ave, Morningside, Kingsland, Mt Eden then to Newmarket West where regular scheduled bus services can take you to Alexandra Park and the Auckland Flower Show - however depending on demand special shuttles may be organised to take you direct to the show. As any special shuttle buses to meet you at the Station and take you direct to the Flower Show will be purely dependant on demand, then make sure that you register now and let us know so that we can plan services to suit you. Alternatively if you live between Pt Chev and the venue then bus route 007 starting from Coyle Park down Pt Chev Road stops at the door of the venue, and leaves Pt Chev every 15 - 30 minutes during the week, every 30 minutes on Saturday & Sunday. To get to the Auckland Flower Show in the most sustainable and efficient manner, please start thinking about using public transport - it will get you to the door quickly and efficiently, and you'll be doing your bit to help the planet. Any special buses or express services to the Flower Show will be purely dependant on demand so make sure that you get your tickets now and specify that you are looking at public transport in the "Comments" field, and check back regularly for updates.